In dreams, images evoke responses that we don't quite comprehend. They contain figures, faces, and suggestions of things whose exact meaning often remains both elusive and provocative. It is that kind of provocation that I'm striving to capture in my abstract photographic images. The most important part of the creative act for me is the mysterious journey of discovery as I explore the consequences of 'tampering' with my own source image photographs. I think of it as tampering because it is a sort of illicit alteration of the "truthfulness" of photography. My work starts out with my own photographs of landscapes, architectural details or colorful scenes and other unusual views. These are the source photos for my images and also my inspiration. In their photographic transfor-mation into an entirely new work, the influence of the source images remains. My process simultaneously alters and obscures their initial forms but utilizes them as my palette and brush. I mix color, shape, mood and texture from their original essence. Ultimately I convert these realistic photos into my abstract images. My work uses bold, saturated, and intense colors both because they appeal to me and also to make clear that the images that result are not photos of a rational observable reality but instead represent vistas of my own idiosyncratic landscape of abstraction. I believe that by stripping away the obvious narrative content and context of a photo-graph and creating an abstract image from it, that the viewer is freed to view the image through their own emotional imagination. I am intentionally divorcing my work from the abundance of everyday photography that pervades our modern hyper-visual life on the internet, on TV and in print. I am challenging the truth of photography; the expectation that photography is only for accurately capturing and depicting an external observable reality. I am removing both the narrative and historical context that ordinarily establishes the photographer’s intention. I am cloaking the photograph’s purpose so that the viewer is left to their own devices, to interact more honestly with the image, and to engage in their own personal search for meaning. 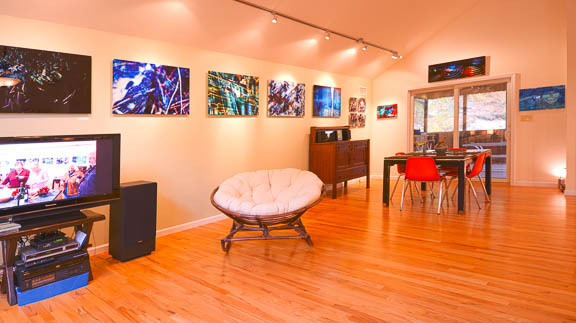 Jonathan Pazer, Studio/Gallery, Gardiner, NY. If you are in the New Paltz/Gardiner Area or passing by Exit 18 on the NYS Thru-way, and you would like to visit my studio/gallery, I'd be delighted. ​Please contact me to make an appointment. I am frequently able to make a short notice appointment, but for best results, call in advance. As an artist I have been seeing details, patterns and textures all of my life and all the while having a curious sense that the world as I observe it differs from what other people see. I don't believe that these are two different worlds, only that what excites me are things easily over-looked. My chosen medium has evolved into abstract photography from from an amalgamation of my interests in origami, caligraphy, drawing, photography and computers. Before practicing art, I practiced law in New York City. I currently make my home and studio in Gardiner, NY. I have come to understand that what differentiates art from the rest of our everyday experience is that art asks that we pay attention to it. It is the act of 'paying attention', the active search for meaning and understanding, and the space that art can open in our minds, that fuels my enthusiasm as an artist. 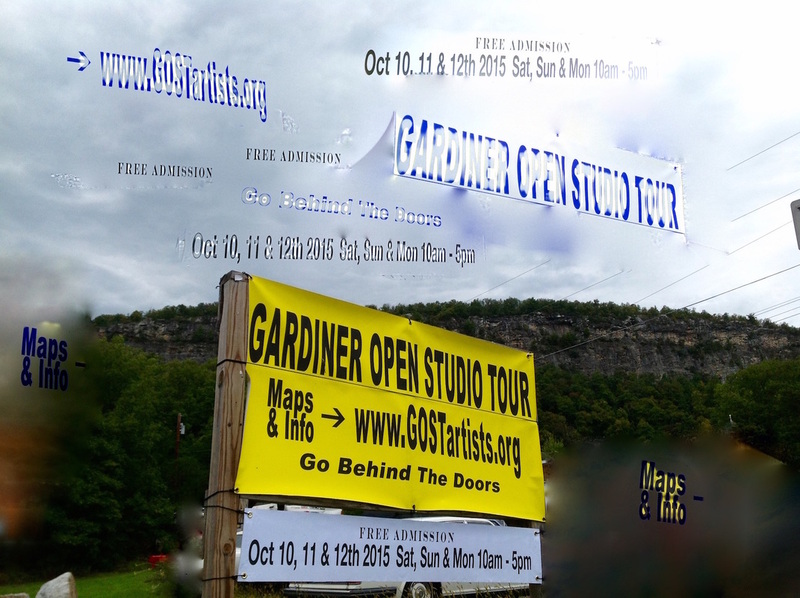 Gardiner Open Studio Tour, showcases the artists of Gardiner, New York. During this event local artists open their homes and studios to the general public for a glimpse at their work and their workplaces. At any given time I am participating in different shows at different venues all around the Hudson Valley of New York, and beyond. For detailed information and show dates please see the Events and Shows page. I constantly update this page as new shows are added to my schedule. Also feel free to contact me with any questions or comments. 510 Warren Street Gallery, Hudson NY. December 2014. Featured Artist, Jonathan Pazer. The show title: "Sharpening the Edges." 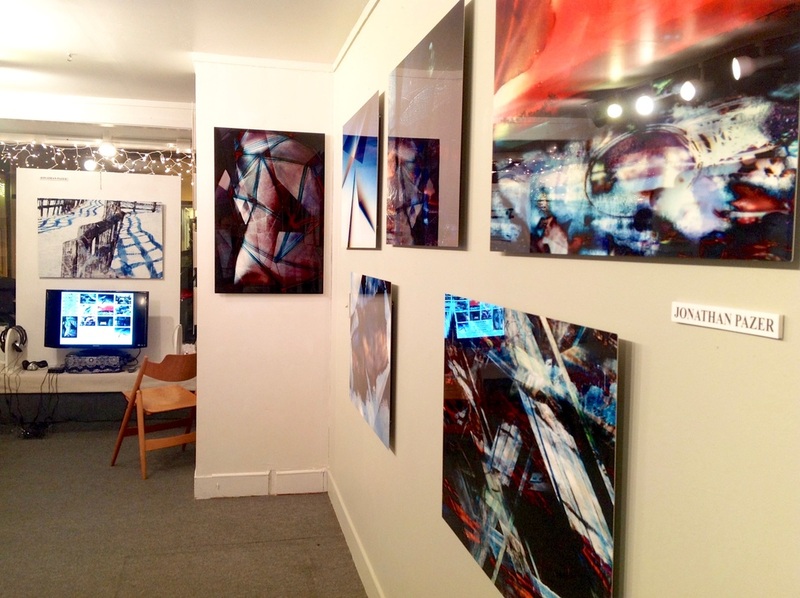 My abstract photography images have been seen around the Hudson Valley over the past several years, starting in 2011. In Albany, New York at the Albany Women’s Club Holiday Show in 2011, Redhook, NY at the RHCAN gallery in several shows, including the juried “PHOTOgraphy” shows in both 2012 and 2013. My piece, "Roadside Attractions" won Honorable Mention in the 2013 "PHOTOgraphy" show. A portion of my 13 piece show ‘Tampering with the Seals’ show was seen at the Gardiner Library in Gardiner, NY Oct. 2-31st 2013. My digital brush and ink paintings were seen in Gardiner NY in September 2013 and Feb. 2013 in New Paltz at the Gomen Kudasai Noodle Shop. Finally, as a founding member and now chairman of the twice yearly Gardiner Open Studio Tour [www.GOSTartists.org] I have presented a new show in each of five successive tours at my home/studio in Gardiner NY. Beginning 2013 with my Seed Image Collages, then Tampering with the Seals in Spring 2014, Sharpening the Edges, Fall 2014, Landscape Thoughtography Spring 2015 and most recently nine new images along with the 'best of' from prior shows. Multiple pieces have been shown online through SEE.ME's many events and shows around the country.